Tastefully decorated 3 bedroomed 2 bathroom cottage, close to beach, views. path passes the property and the golden sands of blue flag beach Woolacombe is a 15 minute walk. The property has 3 double bedrooms, 2 bathrooms and an open plan living area and kitchen. The paved terrace overlooking the sea is a wonderful spot for a glass of wine watching the setting sun. Well equipped with all modern conveniences, smart, tasteful interior decoration. Perfect location for a family beach holiday or walking holiday. Great for learning to surf or exploration of the North Devon area. I grew up in Australia but have lived in UK for many years based in London. On a recent visit to Devon I came across this beautiful cottage and was blown away by its location and stunning views. I had to have it as I have always wanted a place by the sea and this cottage ticked all the boxes. Close to the sandy beach of Woolacombe, great surfing for my daughter, with stunning coastal and countryside views and great walking, there is something for everyone in the family. A little gem. Beautifully appointed property in the most amazing location with wonderful views from every room. Parking for one car only. Additional parking is available in the village car park. Large sofa seating 6 comfortably, tables, flat screen tv, video player. Terrace overlooking the sea. Table and chairs. Deck chairs. The property is on 3 levels so if stairs are a problem it would not be suitable. There are quite steep steps from the road to the front door. The terrace drops off as the house is built on a steep slope. Young children could fall from the terrace if not supervised. The inside of this place is really surprising, great layout, enough space and decent spec. The picnic bench in the garden looking out to sea and the sunset was just perfect. Norah was great and i’d Stay here again and again and recommend this place. Lovely property with amazing views. Stayed here with husband, daughter, son in law and granddaughters. The house was big enough to accommodate us all with ease. Having two bathrooms was a bonus. The kitchen was well equipped with everything needed for a comfortable stay. It would be useful to have a broom or a vacuum cleaner available rather than making do with the dustpan and brush. It is a short walk to Mortehoe village however those with limited mobility may find the walk a challenge as it is up a very steep hill. There are two pubs in the village both of which are very popular and we found eating here difficult as there were queues for tables and no booking possible. Woolacombe is the other direction and about 15 mins walk downhill. The take away in the village was amazing and I would definitely recommend this. There is a parking space outside the property which is useful but as we had two cars it involved one being parked in the village car park. The walks from just outside the property were spectacular. We had young children with us and In hindsight the position of the house was not ideal as a pushchair was not really useable and trips out either involved the 15 month old being carried in a sling or going in the car. Despite this we had an enjoyable holiday in a spectacular location. Thank you so much for visiting Coast House I am so pleased you and your family enjoyed your stay. Hope to see you again. We just spent 5 nights at Coast House and it was lovely. The views over the coastline are stunning and was so good to be able to walk to the beaches. The house itself has everything you need for a very comfortable stay. The teenagers appreciated the excellent WiFi and it was great to have a second bathroom. Would have no hesitation recommending this property and coming back for another stay. Hi Krissy. I am glad you enjoyed your stay at Coast House and I hope the weather was kind to you. Hope to see you again. The property is located in the pretty village of Mortehoe with its pubs and restaurants, cafes and small museum. The South West Coastal path passes the rear of the house and is great for walking. 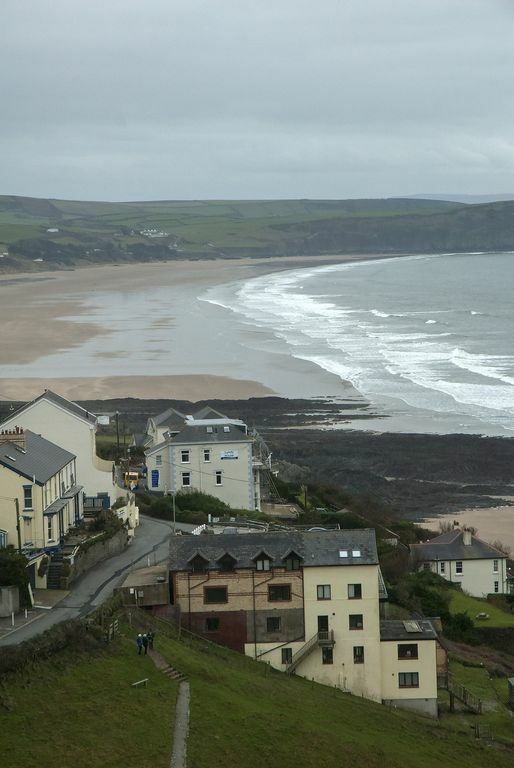 The golden sands of Woolacombe Beach is a short walk, perfect for family beach days and surfing. Grunta Beach is an even shorter walk just below the house, great if you want a beach to yourself. There are numerous other activities in the area, trips to Lundy Island, National Trust properties to visit, quaint Devon villages to explore. The Tarka trail is a great adventure for cycling enthusiasts and families alike. The towns of Barnstable and Bideford are a short drive away for those seeking some retail therapy. Plenty of local activities for those inevitable rainy days, mini golf indoor bowling cinemas museums.